This bottle includes premium 18/8 stainless steel on the outside that is able to withstand any day to day wear. 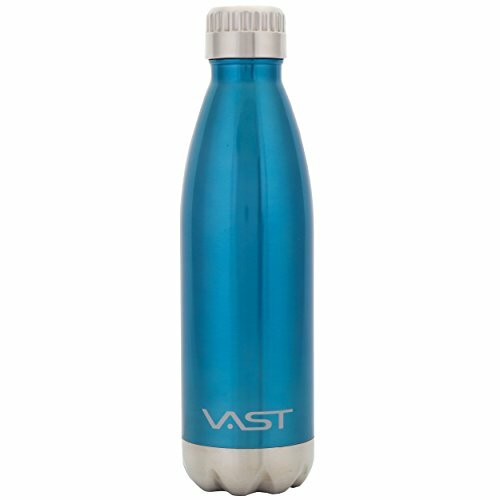 With its vacuum insulation technology and copper coated lining, Vast HydraCore bottles are meant to keep hot beverages hot for 16 hrs and cold for 24. ✅ VACUUM INSULATION - Our 17 oz bottle has a double-wall exterior that helps keep your beverage at an optimal temperature whether it is hot or cold. ✅ ECO-FRIENDLY - Vast Vantages HydraCore bottles are made with a high quality stainless steel metal that does not easily break down. Making it very eco-friendly and budget sufficient. Using one of our bottles, helps rid the planet of waste! ✅ INSULATED LID - Double-Wall Will keep from any drinks leaking out while on the move, our premium construction can withstand any day to day wear. This lid stands out from the rest because the stainless steel wraps around the whole lid to prevent the cap from detaching from the plastic component. ✅ SWEAT FREE DESIGN - The double wall on this tumbler will keep the outside from forming condensation, and keep all the moisture inside. Also preventing any temperature changes to the exterior, making sure you don't burn yourself or leave a ring of moisture on any table top. If you have any questions about this product by VAST HydraCore, contact us by completing and submitting the form below. If you are looking for a specif part number, please include it with your message.